This season, my first season as a professional bodybuilder, I’ve approached prep differently in a number of ways. Bodies are neat. They can adapt to all sorts of things. And frankly, I was BORED of the stuff I had done before. I’ve always treated my body as an experiment, n=1. This season has been no different. One of the changes I’ve implemented this season, starting back in January, is that I took a break from my regularly programmed powerlifting training. 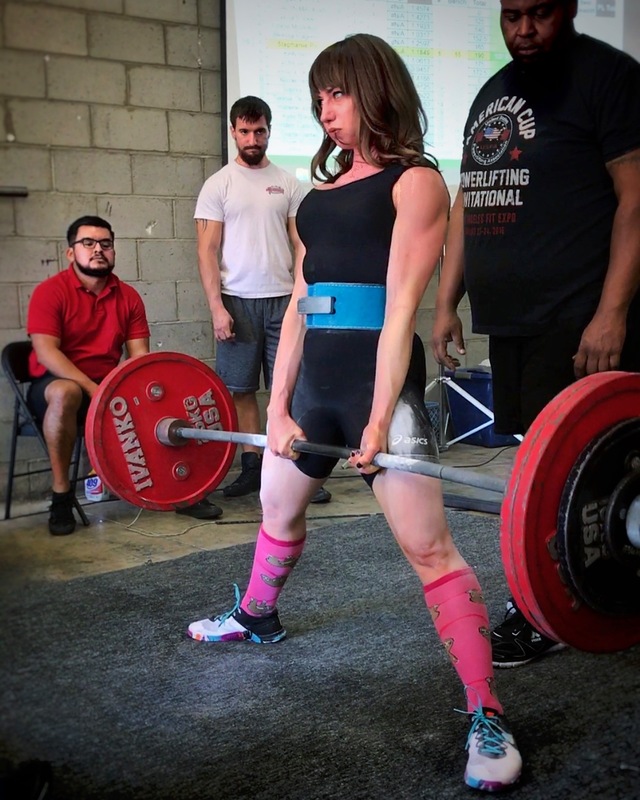 In previous seasons I’ve continued training the big three- bench, squat, and deadlift in the same styles I use to compete in powerlifting (medium grip, low bar, and sumo respectively) at up to 90% of my maxes, but after a record setting powerlifting season, I truly needed a break from it for a while. I have been training those exact same movements for literally years, with very little variation. I adopted, then, Renaissance Periodization’s Female Physique Templates 5 day program, a purely hypertrophy based program. I switched out my competition bench for variations like close grip barbell bench or low incline dumbbell press, rotated my squats between high bar and front squats, as well as some unilateral lunges and leg press work, and took out deadlifts almost entirely for most mesocycles, largely to prevent the inevitable shin bruising as I neared stage, but equally due to the fact that heavy squats and dreads make me hold water- up to 5 pounds- for a few days following and that’s very difficult for me mentally when I’m so focused on the scale moving down as I near stage. I worked in rep ranges I have rarely if ever utilized before- where I typically have worked in the 3 to 12 range, I found myself doing regular sets of 16, 20, sometimes higher. If it was a change in stimulus I was seeking, it as indeed what I found. This program consists of four different mesocycles, or training blocks, of four to five weeks each, with each culminating in a deload week before beginning the next. The first two mesos are general hypertrophy work- aiming for a rep range of six to twenty, with volume accumulating each week via additional sets typically. Meso 2 is pretty brutal- by the end you’re begging for that programmed deload. The next mesocycles is a fun delve into metabolite training, that is, the goal is to accumulate metabolites such as lactate in your muscles. You do this by taking nearly no rest between sets- just enough pause to catch your breath before starting your next step. The goal rep range in this block is ten to thirty, and the weights are necessarily a bit lighter than the previous two mesos. As you can imagine, this means your sets go by quite quickly, and your gym time is short during this block, but your reps decrease considerably each consecutive set, and by the end of each movement your muscles are just screaming. This is the best meso for taking pumped up gym selfies, because you walk out of the gym like an absolute balloon animal after about 30 minutes of work. On the training spreadsheet, training days are split up smartly with upper push and pull days, and legs with push and pull and glute specific targets as well. You choose from a drop down menu from a list of five to ten options within each category (eg. vertical press, quads, horizontal pull, delts…) the movements that you will be training each day of each mesocycle. You then give a tested or estimated 10 rep max for each movement, upon which the actual weights you use each day are calculated. This is precisely why I chose this program- the basic format made sense in its organization, but the exercise choice was varied enough that I didn’t feel as though the program was of the cookie cutter variety. The fact that the exact weights to be used each session are already calculated for you removed so much stress from me as well. The weights change, too! For each movement in a session, you rate the lift based on your soreness from the previous session and how difficult that made this session- easy, on target, or difficult. Based on this rating, the spreadsheet autoregulates via changes in weight or sets for the next week. This piece is phenomenal- it ensures you get the appropriate amount of volume, so long as you are eating properly, and not with your ego or being a whiner. It was challenging, but not crushing- just enough. I experimented with movements I hadn’t used before, and learned a lot thanks to the linked videos for each movement within the spreadsheet. I was wondering if you find this program useful to you in the offseason as well as in competition prep? Or do you find for yourself that your powerlifting methods benefited you best in the offseason? I would say that neither approach is correct and neither is incorrect. For me, I prefer the powerlifting style of lifting. However, this program would probably be great to run in a maintenance or gaining phase as well if you enjoyed it, and you’d probably gain a fair bit of muscle using it. For me, switching to a different program as I move into my bodybuilding offseason is about having different goals and needing to switch things up to keep myself more interested and focused so I’m able to progress. Previous Post 2017 WNBF Worlds Prep- Now on Video!